Summary: Izta is a princess of the people, so when she falls in love, it isn’t with one of the wealthy suitors who travel from distant lands to court her. The warrior Popoca can’t offer her riches, but he recognizes her kind heart and promises to always be faithful to her. The king would prefer a more titled son-in-law, but he agrees to let the two marry if Popoca can defeat Jaguar Claw, a neighboring king who has caused trouble for years. Popoca goes off to battle. When Jaguar Claw realizes he is near defeat, he sends a messenger to tell Izta that her fiancé has been killed. Grief-stricken, she drinks a potion that the messenger says will ease her sorrow. Instead, it puts her into a deep sleep from which she never awakens. When Popoca returns, he brings her outside to try to revive her, and there they stay, together, until they have turned into the two volcanoes, Iztaccihuatl and Popocatepetl. An author’s note gives more history of this Aztec legend. 40 pages; grades 1-4. Pros: A captivating retelling of a Mexican legend that explains the existence of two volcanoes visible from Mexico City. 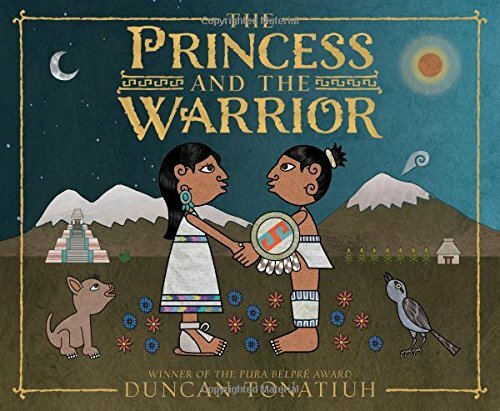 Award-winning author-illustrator Duncan Tonatiuh brings his distinctive style to the art done in the traditional Aztec style. Cons: Even with the glossary and pronunciation guide at the end, pronouncing the Aztec words is a challenge.